Hagravens are a horrific cross between an old crone and a bird. They are extremely dangerous and equally hostile up close or when casting various Destruction spells from afar, usually preferring area-of-effect spells such as Fireball. They can often be found in the company of the Forsworn, or dwelling in secret groves and lairs in the wilderness with other witches and hags. They will sometimes be found summoning Forsworn Briarhearts. The Forsworn revere hagravens as their matriarchs and leaders. Few creatures match the cunning, depravity, and repulsiveness of the hagravens. They will take through savagery what they cannot win through guile. Hagravens were once witches that have undergone a ritual, as seen in the quest Repentance. 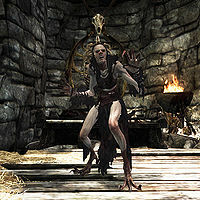 According to Herbalist's Guide to Skyrim, these creatures have traded in their humanity for access to powerful magics, and the transformations they undergo infuse their entire beings with some element of that power. Hagravens will tend to appear either individually or in groups of three. You'll find yourself engaged to one after drinking too much in the wrong company. A unique hagraven encounter is located at Hag's End. Heavily armored warriors may find it easier to charge in fight toe-to-toe, because your armor will better protect you against their claws than their Destruction spells. Characters with more elemental resistance might wish to hang back and fight from a distance for similar reasons. It's also worth noting that a hagraven's claw attack is rather slow and easy to dodge. It is entirely possible, and somewhat easy, for even a low level character to defeat one just by moving back slightly after every time you take a swing at them. This page was last modified on 17 December 2018, at 21:24.